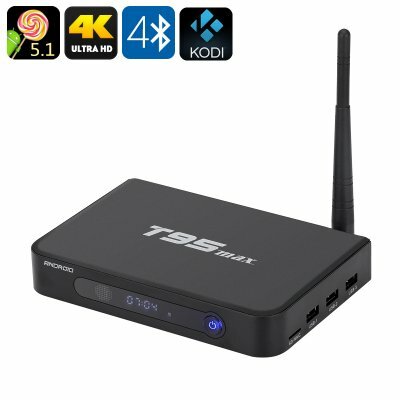 Successfully Added T95max Android TV Box - 4Kx2K, Android 5.1, Bluetooth 4.0, Wi-Fi, 2GB RAM+32GB Memory, Kodi to your Shopping Cart. Watch you favorite TV shows and indulge in some immersive gameplay with the T95max Android TV Box, coming with 4Kx2K support, Bluetooth 4.0, AlmogicS905 quad core CPU, pre-installed Kodi and more. The T95max TV box brings the best of Android to your big screen TV — enjoy the familiar interface with easy navigation and lots of fun apps. Plus, don’t forget to hit the Play Store for some more entertainment options. With 4Kx2K support, you will have the opportunity to see your movies in a truly great quality. 32GB of internal storage and an additional 64GB supported on an SD card so you can load up on content to your heart’s content. Kodi 16.0 comes pre-installed and is a great media hub to have on your TV. With it, you will not only have a ready app to play your media, but also access to lots of free content from Kodi’s repositories. The 4K TV box comes with 3 USB ports, HDMI, an SD card slot, SPDIF and Bluetooth 4.0 for wireless connectivity. So, you can hook up stereo speakers to enhance your watching experience or headphones if you prefer to keep things quiet. Powered by the Almogic S905 quad core processor and coming with 2GB of RAM, the TV box can easily handle multitasking, so don’t worry about having several apps running at the same time and with its 2GHz processor and Mali 450MP GPU it handles gaming with ease. The T95max sports a nice compact design and won’t take up much space. Simply place it by your TV set and be amazed at what the little Android media player is capable of. This powerful Android TV Box comes with a 12 months warranty, brought to you by the leader in electronic devices as well as wholesale TV Boxes and Mini PCs..